When I was young and learning about the solar system, Pluto was the ninth planet. It seems strange to think that only a few years ago it was decided that Pluto was no longer a planet at all. Pluto’s Secret, told in narrative form, is the story of how that came to be. For children who may never know any different, this is a handy insight into Pluto’s history and the world of astronomy generally. The story of Pluto begins with a search by astronomer Percival Lowell, who was convinced there was another planet out there past Neptune. That planet’s eventual discovery by Clyde Tombaugh, an employee at the Lowell Observatory, came in 1930. Originally called Planet X, it received its official name courtesy of a suggestion by an English school girl. So why isn’t Pluto a planet any longer? What is a planet anyway? Over time astronomers investigated the unique nature of Pluto and compared it with other planets, as well as other “icy worlds” nearby. They defined a planet as something that orbits the sun, is round like a ball, and is alone in its own orbit. Pluto fulfilled two of those criteria, but being recognised as part of the Kuiper Belt, where multiple worlds were all in the same orbit, didn’t meet the third criteria. As a result, in 2006 Pluto was declared to no longer be a planet. 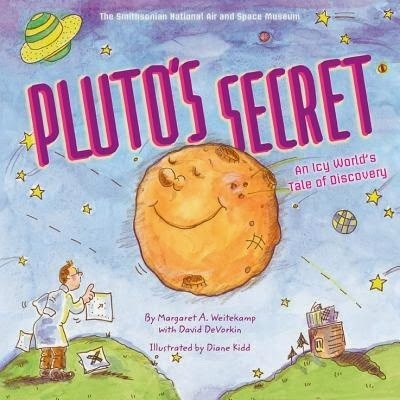 Pluto’s Secret is from the Smithsonian National Air and Space Museum, and is a simple way to introduce children to the concept of planets, and more specifically to explain the Pluto situation. Along with drawings throughout the story, at the end of the book there are photos to show a bit “behind the scenes”, as well as a short “who’s who” summarising the people involved, and a glossary, bibliography and suggested further reading.